This third education conference, hosted by US Ambassador Michael Michalak, took place on January 14-15, 2010 in Hanoi. In addition to the U.S. Mission in Vietnam, the Conference was also sponsored by Vietnam National University, Hanoi, and the Ministry of Education and Training (MoET). The Embassy reported that 620 people registered for the conference. 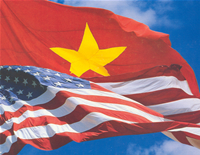 Included in the original schedule was a breakout session entitled “The Role of Agents in Recruiting Vietnamese Students for Study in the U.S.” Regrettably, this session has been deleted from the final version. This is no doubt a result of the US State Department’s refusal to address this important and timely issue. Here is a link to the conference booklet (PDF, 2.4MB), which includes the schedule, list of participants with contact information, and descriptions of many of the represented institutions, organizations and companies.